Veteran singer Neil Young has recorded an anti-war protest album on which he reportedly lashes out at George W Bush in a song called Impeach the President. The Canadian star has described Living with War as "metal folk protest". The title track includes lyrics such as: "On the flat-screen we kill and we're killed again. And when the night falls, I pray for peace." Young is one of rock's most political artists, thanks to classic anthems such as Rockin' in the Free World and Ohio. The 10 tracks on Living with War were recorded earlier in April and feature a 100-strong choir, the singer said on his website. On the title track, he sings: "In the mosques and the doors of the old museum, I take a holy vow, to never kill again, try to remember peace. "The rocket's red glare, bombs bursting in the air, give proof through the night that our flag is still there." Young has not confirmed details of the other tracks, but there are widespread reports that he makes a more direct attack on President Bush in Impeach the President. The new material comes 36 years after the star became an icon for the anti-war movement with Ohio, his response to the deaths of four students during a Vietnam war protest. LOS ANGELES (Reuters) - Veteran rocker Neil Young has recorded a protest album featuring an anti-Iraq war track with "a holy vow to never kill again" and a song titled "Let's Impeach the President," the singer said on Monday. The 10-track set, called "Living with War," was recorded this month by a "power trio" -- electric guitar, bass and drums -- plus trumpet and a 100-member choir, the Canadian-born musician announced on his Web site. Young's longtime manager, Elliot Roberts, told Reuters the album, which has been the subject of Internet buzz for several days, will be played for executives at his label, Warner Music Group's Reprise Records, on Tuesday. Reprise spokesman Bill Bentley said Young's latest effort, which he spent about three days recording, came as a surprise. "We didn't know he was making a record," Bentley said. "That's the beauty of Neil Young." Young, 60, is the latest in a string of big-name recording stars to take musical aim at President Bush and his conduct of the war in the Iraq. Others have included Steve Earle ("Rich Man's War"), Willie Nelson ("What Ever Happened to Peace on Earth") and the Rolling Stones ("Sweet Neo Con"). But "Living with War," coming from one of the most influential and iconoclastic singer-songwriters of Young's generation, may be the most heavy-hitting anti-Bush protest yet to surface from a major rock star. In a message crawl along the bottom of his Web site, www.neilyoung.com, Young drew parallels to two of the leading protest singers of the 1960s, saying of his new record: "I think it is a metal version of Phil Ochs and Bob Dylan ... metal folk protest?" "In the big hotels ... in the mosques and the doors of the old museum ... I take a holy vow ... to never kill again." Roberts confirmed that a separate song on the album is titled "Let's Impeach the President." He declined to disclose any further details about the record. But according to some online reports, that song accuses Bush of "lying" and features a rap with the president's voice set against a choir singing "flip-flop." One member of that choir, a California-based musician, wrote on a "blog" entry last Friday that the recording session wrapped with an a capella version of "America the Beautiful." Young's latest offering comes just seven months after the release of his last album, "Prairie Wind," which has sold about 450,000 U.S. copies as of last week, according to sales tracking service Nielsen SoundScan. Music from that album was featured in the recent concert film "Neil Young: Heart of Gold," directed by Jonathan Demme. "Living with War" appears to bring Young full circle from a more pro-Bush administration stance he took in the months following the September 11 attacks. Not long after recording the song "Let's Roll," a tribute to passengers who apparently fought back against hijackers on doomed United Airlines Flight 93 over Pennsylvania, Young came out publicly in support of the U.S. Patriot Act. The legislation, which gave law enforcement authorities broad new powers aimed at bolstering the administration's war on terror, was harshly criticized by some as threatening civil liberties. But at a December 2001 ceremony accepting an award from the free-speech advocacy group People for the American Way, Young said he believed the measure was necessary, though he urged the audience to ensure that its more controversial provisions were only temporary. "Living with War" is hardly the first work by Young to take on the political establishment. As part of Crosby, Stills, Nash & Young, in 1970, Young wrote and recorded the song "Ohio," about the four Kent State University students killed by National Guard troops during an anti-Vietnam war rally. Nearly two decades later, he book-ended his album "Freedom" with the song "Rockin' in the Free World," which chided Bush's father, then president, with the lyrics: "We got a thousand points of light/For the homeless man/We got a kinder, gentler machine-gun hand." Look out George W Bush! A full tracklisting and biting lyrics have emerged of Neil Young's forthcoming album 'Living With War' - and it seems that as had been reported the entire record is a concept album about the policies of George W Bush at home and abroad. According to the website Down With Tyranny, which claims to have been given a personal playback of the record by Young's manager Elliott Roberts, the album was written and recorded in nine days following a conversation the singer had about the politics of the Bush administration with Steve Bing, a film producer friend who funds radical causes in America and recently donated $10 million to a study of global warming. The political tone is set by opening track 'After the Garden', which kicks off with the lyrics : "Won't need no shadow man runnin' the government." It's followed by the title track, which incorporates part of 'The Star Spangled Banner' as Jimi Hendrix famously did at Woodstock in 1969. 'Shock And Awe' refers directly to the bombing of Baghdad with the lyrics: "Back in the days of shock and awe, thousands of children scarred for life/ Millions of tears for a soldier's wife, both sides are losing now." 'Flags of Freedom' returns to the theme with the lines: "Today is the day our younger son is going off to war." 'The Restless Consumer' is built around the refrain "Don't need no more lies" while 'Let's Impeach The President' is even more forthright, with the words: "Let's impeach the president for lying, misleading our country into war/Abusing all the power that we gave him and shipping all our money out the door." Other titles include 'Lookin' For A Leader' and 'Families' and the album ends with another Iraq song, 'Roger and Out', which includes a 100-piece choir singing 'America The Beautiful'. No release date has yet been set but given the topical nature of the material Young is said to want the album out before the summer, and is also reportedly considering streaming the songs on the Internet. Several female artists have covered Neil Young on a charity tribute album due out next year. 'Cinnamon Girl - Women Artists Cover Neil Young for Charity' will be released in February and features artists including Tanya Donelly of The Breeders and Throwing Muses fame, Britta Phillips, Lori McKenna, Jill Sobule with John Doe, Elk City, Veruca Salt, Kristin Hersh, Josie Cotton and The Watson Twins, among others. Proceeds from the album will go toward Casting For Recovery, a charity aiding in the recovery of women with breast cancer through fly-fishing for mental and physical healing. Been owning "Harvest Moon" for a long time and knew just the "hits" but recently I've been listening to it a lot at work. And I was just wondering if there's any experts who could recommend me similar Neil Young albums or any other artists who've produced the same acoustic feel good vibe? Thanks. 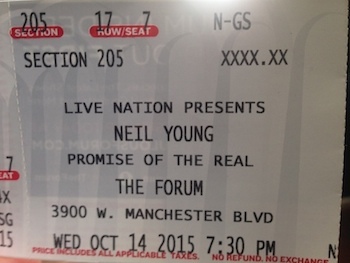 seeing Neil Young live is now checked off my bucket list.